In addition to the 7 Main Chakras you have many other energy centers that are part of your energy system. The Sacred Gaia Chakra Connection focuses on the Gaia Chakra which is aligned with the spine below the feet. The Sacred Gaia Chakra Connection can assist you to draw in spiritual energies from your crown chakra through your chakra system and ground them. Working with this attunement helps your souls Light Body in connecting deeply with the sentient spirit of Gaia for soul purposing, elemental connections with the Faery Realm and Earth and Nature Spirits. 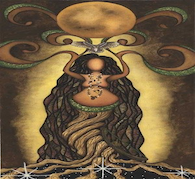 There are two levels in The Sacred Gaia Chakra Connection Master Teacher Attunement. The founder requests a mandatory 14 day waiting period between receiving Levels 1 and 2. You may receive Level one either as a chi ball, or Orb of Life. Level two is send by Orb of Life only. There is one Level for the Personal Use Attunement. It can be received by either method.